Dr. Bark is the Minister of Trade at the Ministry of Foreign Affairs and Trade. Prior to this, he was a Professor of international commerce at the Graduate School of International Studies, Seoul National University (SNU). At SNU, Dr. Bark served as the Dean of international affairs as well as the Director of the Institute for International Studies. 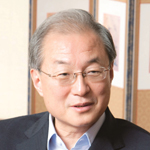 Prior to joining SNU, he taught at Georgetown University, worked at the Korea Development Institute (KDI), and served as the Vice President of the Korea Institute for International Economic Policy (KIEP). He also taught at the University of Washington and at Stanford University as a visiting professor. He has also worked as a senior economist in the Office of the President of the Republic of Korea, served as the chair of the Investment Expert Group (IEG) of Asia-Pacific Economic Cooperation (APEC), and as chairman of the Korea International Trade Commission. He received his B.A. from Seoul National University and Ph.D. in economics from the University of Wisconsin-Madison.